The Merge and Replace dialog is useful if you have extracted or split your project into different project to allow different project collaborators to work on it, but have kept a copy of the original project (or master project). With this dialog, you can replace the original scenes in the master project with the updated scenes in the extracted project. Optionally, you can keep a copy of the original scenes so that you can compare them. You can also customize which scenes from the extracted projects should be imported into the master project. NOTE When merging projects, the video and sound clips in the master project will remain synchronized with the cue time of their respective panels. Clips that extend beyond the boundaries of a panel will be synchronize with the panel in which they are cued, not the panel in which they end. For tasks related to this window, see Merging Projects and Replacing Scenes in the Current Project. Displays the list of Storyboard Pro project files selected for merging with your current file. NOTE A checkbox appears to the left of every project in the list. Checking that checkbox will select every scene in that project for merging into the current project. 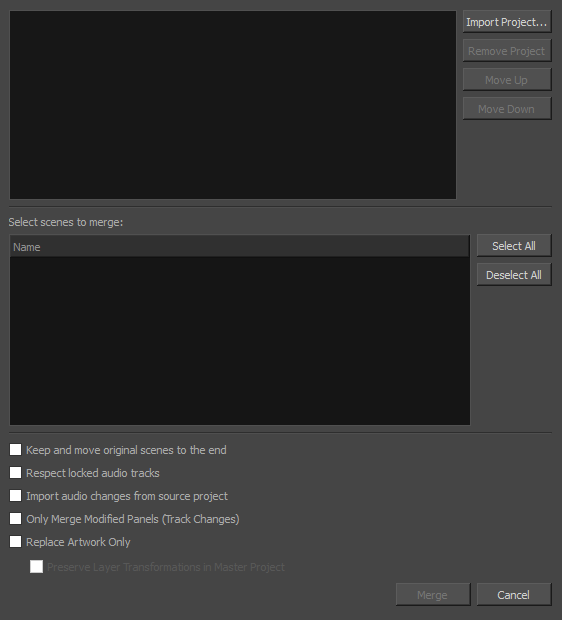 Lets you select the Storyboard Pro project files to merge/replace with your current file. Lets you select any unwanted Storyboard Pro project files and delete them from the list. Lets you organize the files into the order in which you wanted them to be imported in relation to your current file. The list of scenes in the project that is currently selected in the projects list at the top. A checkbox appears left of each scene in the list. Checking this checkbox will make it so the scene is merged from the selected project into the current project. If the project being imported contains sequences, the sequences will also be in the list, and scenes will be listed under their respective sequence. You can check the checkbox next to a sequence to simultaneously select all scenes in the sequence. Checks every scene in the selected project for merging into the current project. Unchecks every scene in the selected project. Creates a backup of each scene in the master project that gets replaced by a scene in the imported projects. The backup scene will be placed at the end of the project, and its scene name will have the _orig prefix added to it. Ensures that the sound clips in locked audio tracks do not get moved to remain synchronized with their respective panels. Imports the changes done to the audio tracks and sound clips of the imported projects into the current project. Only merges the panels that were tracked as changed in the projects being merged. If this option is enabled, changes made to panels that were not tracked for changes in the imported projects will not be applied to the master project. Replaces the artwork in the master project with the artwork in the imported projects, but does not adjust the timing of panels and scenes in the animatic. NOTE Layer transformations and animations in the master project will still be replaced by layer transformations and animations in the imported projects unless the Preserve Layer Transformations in Master Project option is enabled. With the Replace Artwork Only option enabled, layer transformations in the master project are still replaced by the layer transformations and animations in the imported projects by default. With this option enabled, drawings in the master project will be replaced, but not the transformations and animations on their layers.